Welcome to Burrenreagh: A Unique School Offering an Exceptional Educational Experience. Welcome to the website of St. Patrick’s Primary School, Burrenreagh, Bryansford. 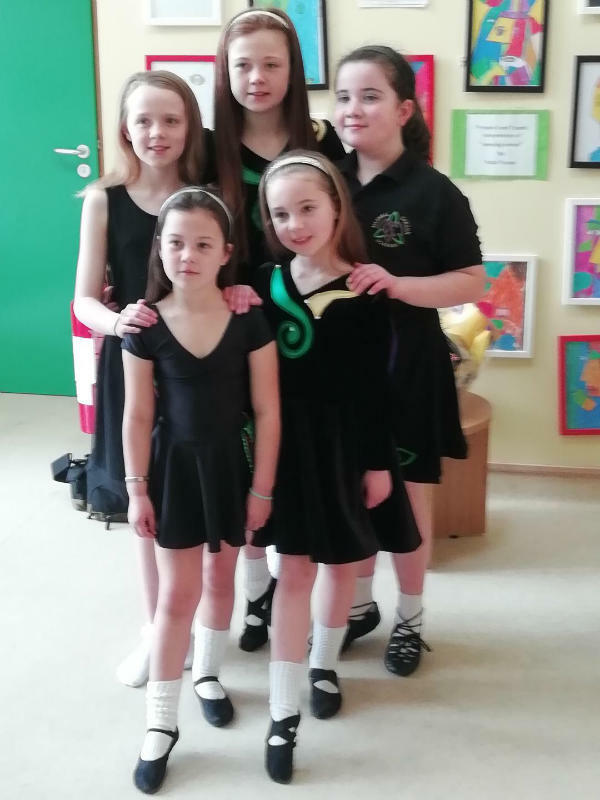 Set in an area of outstanding natural beauty close to Tollymore Forest Park, we are a vibrant, caring, thriving rural school that serves the Newcastle and Castlewellan area and beyond. At St. Patrick's, staff work together to ensure that all children reach their full potential and receive an education in an intimate setting which inspires lifelong learning. Ours is a friendly school with a true family atmosphere where we offer an exceptional educational experience. We are proud to have small class sizes (an average of less than 20 per teacher) which bring enormous benefits for pupils with extremely high standards of achievement. The pastoral care of each pupil is of the utmost importance for us. 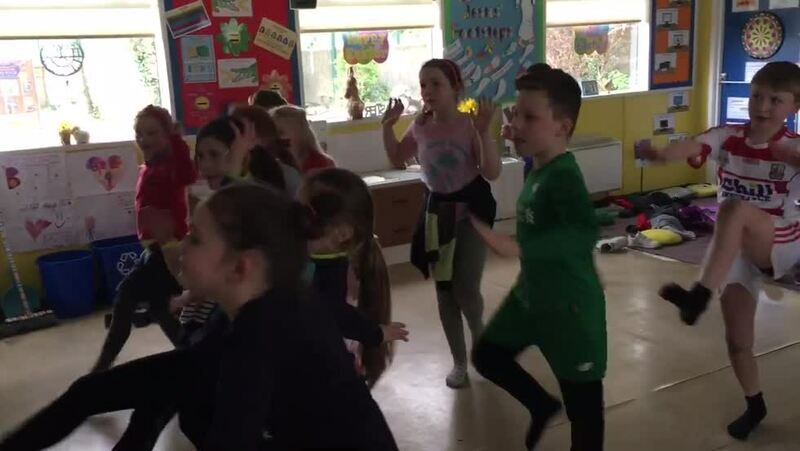 We work hard each and every day to ensure that each child is happy and enjoying all aspects of life and learning at Burrenreagh. You are most welcome to visit us and see our happy, purposeful school environment, with highly professional, dedicated staff who strive for the very best for every child in their care. Please telephone us here at the school office on 028 43778593 to arrange a time to visit us and you will enjoy a warm welcome. Alternatively, you may send an e- mail to jhunt307@c2kni.net . If you can dream it, you can achieve it. That is certainly true for Burrenreagh pupil Rian Walsh. 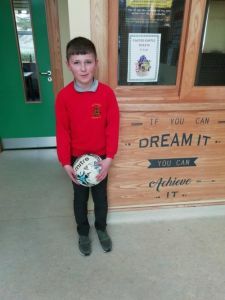 Rian was recently invited by the IFA to take part in trials and as a result, is now part of the Northern Ireland Youth Development Squad in soccer. Well-done, Rian. What a tremendous achievement! Rian will also be joint-captain of our Gaelic Football team this season! Thank you to everyone who has helped us get our brand new fundraising initiative up and running. We aim, over the coming year, to purchase more brilliant reading resources for all our pupils and lots more Chromebook laptops to give every pupil in our school an optimum learning experience in a modern, well resourced school. Pictured above are some of our pupils who have filled Smartie containers with coins to help us achieve our targets. Parental support has been overwhelming. Thank you everyone. Our first pupils have received their pen licences at Burrenreagh. The pupils received their licences and a special commemorative pen at a recent assembly. 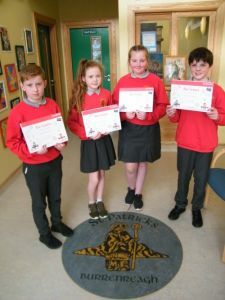 Pen licences are awarded to pupils in the school who display exceptional handwriting in all aspects of their school work. We work hard to develop our handwriting throughout the school. 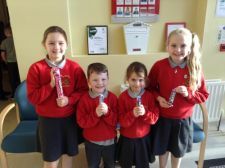 Connie, Mark, Isabella and Louis can now use pens in their work. More pen licences will be granted soon as pupils rise to meet the challenge set before them. No age limit is placed on receiving a pen licence which is measured on proficiency in handwriting alone.